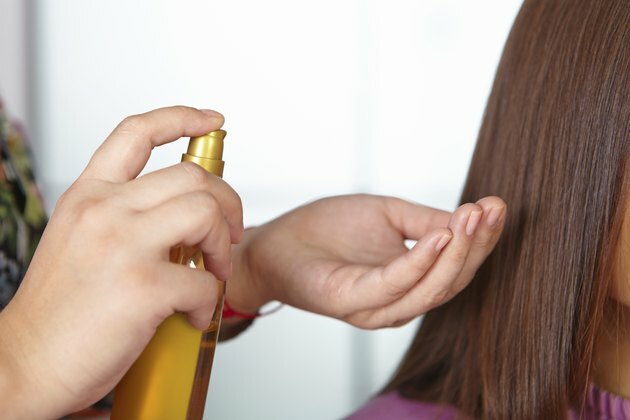 If you have dry, coarse hair, creating smooth and silky strands is easier than your think. Damage caused by harsh chemical treatments and the constant use of hot dryers and curling irons strips the hair of sebum and ceramides, making hair dry, dull, coarse and fragile. By smoothing hair with the right natural treatments, you can tame the frizz and lock in shine -- without making your hair feel crunchy or hard. Sebum produced by your scalp coats each hair and helps to retain moisture. If your hair is damaged, you can help replace the missing sebum by giving your hair a hot oil treatment with a jojoba oil. Warm two tablespoon of jojoba oil and apply it to your scalp. Massage your scalp and then work the oil through your hair to the ends. Wrap plastic and a warm towel around your hair and leave it for 20 minutes. Shampoo as usual and rinse thoroughly. Natural ceramides are fat cells that bond your hair cells together, making the cuticle of the hair smooth and strong. Harsh chemicals destroy the natural ceramides. The cuticle lifts and your hair becomes dull and weak, leading to split ends and breakage. A natural source of ceramides is wheat germ oil. Mix a teaspoonful into 8 ounces of shampoo to make the shampoo richer. 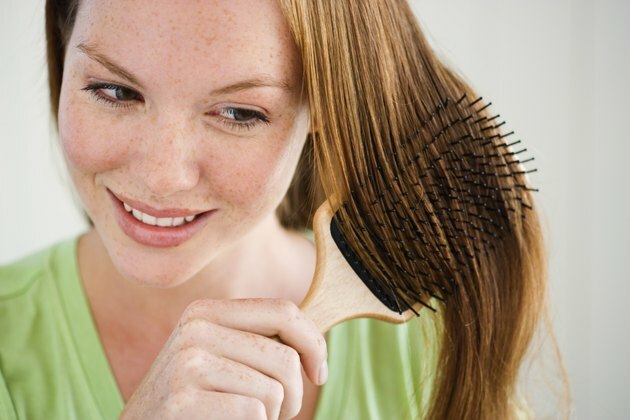 Alternately, massage a teaspoonful of warm wheat germ oil into your scalp and hair before shampooing. Good nutrition leads to healthy shiny hair. Eating a healthy diet and drinking enough water provides the vitamins and minerals your hair needs. Eat four servings of fruit a day and five servings of vegetables. Include healthy oils, such as walnut or olive oil, in your diet rather than animal fats. Drink eight, 8-ounce glasses of water a day. After a hot oil treatment and shampoo, rinse your hair thoroughly with plain water. For your final rinse, pour herbal tea through your hair and leave it in. Chamomile tea, the juice of half a lemon in 8 ounces of water or calendula tea add shine to blond hair as well as sooth the scalp. 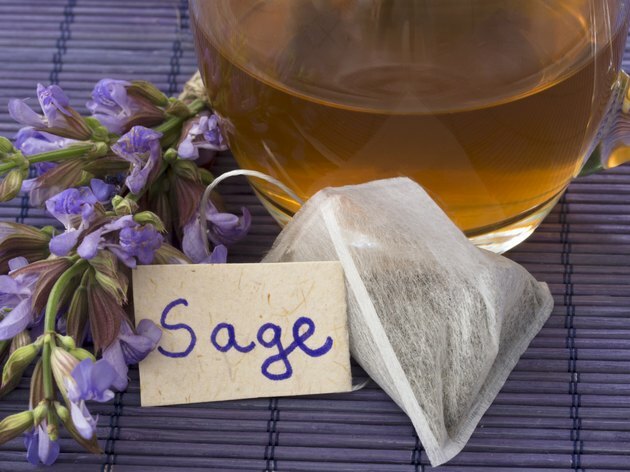 Rosemary, raspberry leaf or sage tea will help dark hair shine. Add four drops of essential oil of rosemary, lavender, thyme, lemon balm, lemon grass or peppermint to a cup of warm water to make an antiseptic, antioxidant herbal rinse. Wash your hair less often, so that you strip less moisture from your hair and scalp. Get a good haircut that suits your hair so that you use fewer chemical treatments and spend less time using hot styling tools. Use a brush with smooth bristles to add shine and avoid breaking your hair. 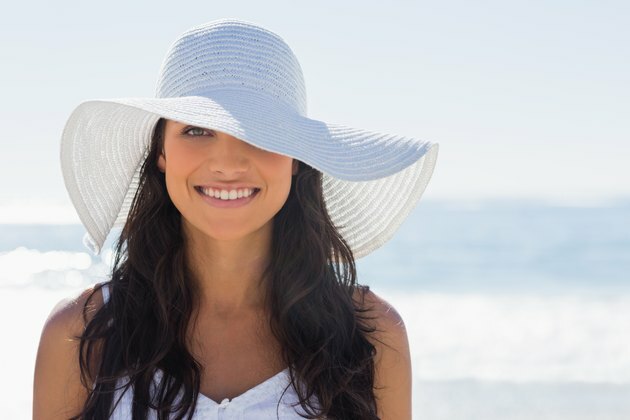 Wear a hat in the hot sun. Rinse your hair after swimming. What's the Fastest Way to Make Your Hair Grow Naturally? Can I Repair Chemically Treated Hair Loss?